When I finished reading ‘Flawed’ – the first in the series – I was impatient to get my hands on the next part of the story. 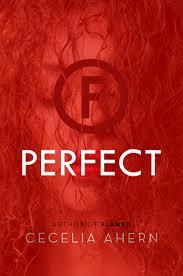 Not due for publication until April 2017, I was more than a little excited when Macmillan publishers and NetGalley approved my request to read an advance copy of ‘Perfect’. Our story picks up with Celestine North on the run, desperate to avoid the clutches of Crevan. She knows that her sixth branding would, if the truth were to be revealed, bring him down – and he is prepared to go to any length to avoid this happening. With publication still some way off, I will just give my initial thoughts. There will be time for a fuller review later (as I will, undoubtedly, read this again). In Celestine Ahern has created a strong character who we remain invested in. The setting plays a major role in the success of the novel; we are urged to question what perfection is, and whether flaws are things to reject or learn from. Though this series is marketed as YA fiction, Ahern tells a good tale and, in ‘Perfect’, she has created a powerful story whose message is timeless.